Aren't they all so lovely! From all the team at SCT "congrats" Becky! Now for the giveaway. If you would like to have not one but two of these stamps in your hot little hands to create with, just leave a comment below! The winner get's to choose! Oh, the choices! This giveaway will close next Thursday at 6:00 p.m. Good luck! A great Silhouette tip with Christa! Good morning and happy Wednesday SCT friends! Have you had a good week so far? We sure have! Today we have our new (and fabulous) design team member Christa Paustenbaugh joining us with a great tip using her Silhouette! “I’m back today and we’re going to take a look at taking those punch outs from the card on Monday to the next level. On Monday I used an Anywhere punch to create punches in the middle of paper and today I’m getting out my Silhouette to make a series of cuts with the same effect. I chose this design to cut out a square of patterned paper for my layout. I chose a kraft patterned paper because I knew I would be backing it with brighter colors. After my Silhouette cut the shapes, I cut strips of bright patterned paper to about 3/4” and adhered it to the back of the cut outs. As a mom of 2 girls of course I went with some bright pinks and love the contrast against all the little heart rows. I think the cut outs on layouts and cards are a great way to add not only embellishment, but also dimension to projects as well. Another design element to use with these cut outs is to keep all those small hearts that were cut out and use them as embellishment too. With mine, I simply flipped them over to the other side that had a brighter pattern on it and used them in the corner of my layout by sewing them on as a banner. You can do this with pretty much any background Silhouette cut. I also use the starburst punches I cut out like the card from Monday. These can be layered with buttons, brads, etc. 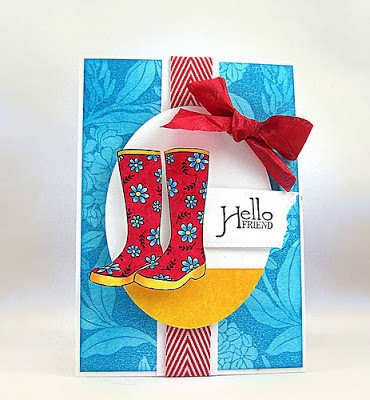 to create an additional embellishment on a page, card or project! 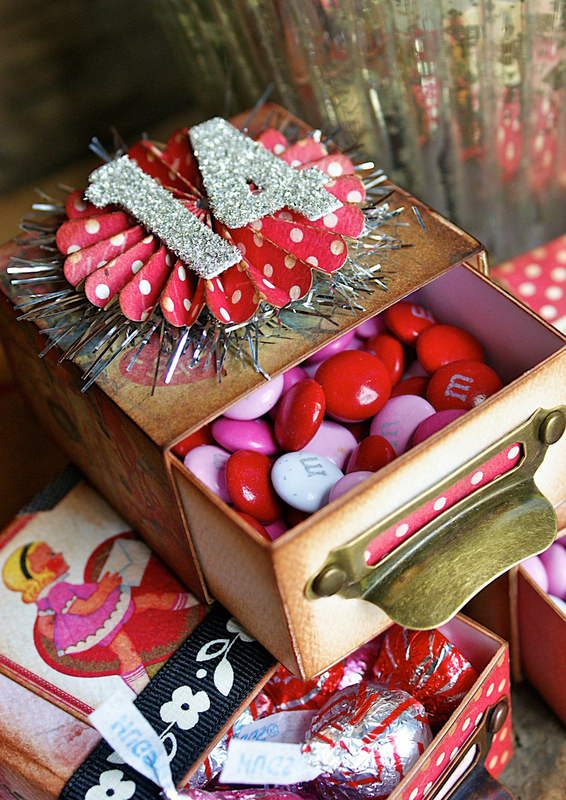 A great way to recycle those extra cut outs! Pssst....have you entered our fabulous Ipad Mini giveaway on Facebook yet? There is still time! Enter RIGHT HERE! It's Tag Tuesday with Vicki Boutin! It's Tag Tuesday!! On the last Tuesday of each month I will be here on the SCT blog to share a tag I created showcasing new products and possibly a technique or two. With so many companies introducing product lines throughout the year we thought this would be a great way to keep you abreast of new releases and "must have" goodies. For the first tag of the series I chose the oh so sweet new line from Doodlebug Design called Lovebirds. The pink, red, aqua and crisp whitebackgrounds make this the perfect collection for Valentine's Day projects and anything that inspires those lovin' feelings. My favourite item in the Lovebirds line are the Mini Love Notes. They are so sweet! I combined the little envelopes along with a trick with buttons and twine. Just another idea for uses for buttons from this months Designer Notebook in the winter issue (view here). This is a super quick way to "tie" your button stash into your artwork. Great to use with chipboard or as a button border. Make sure to checkout this darling line!! See you next month with another peek at something new and exciting!! Pinterest inspiration Monday with Christa! Do you love Pinterest as much as I do?! Like everyone, I browse for everything from food to clothes to how tos and of course all things crafty and scrapbooky! I'm not a natural card maker so I like to look to Pinterest for inspiration on cards especially. I came across this card and pinned it immediately. I love the simplicity of it and loved the banner of paper behind the hearts. As with all projects that I start with for inspiration, it changes pretty quickly and drastically soon after starting!" For my card, I started with a banner strip and instead of stamped/punched hearts, I decided to use an anywhere starburst punch. I also liked the hearts adhered with foam adhesive and adhered my banner with foam instead of the starbursts. From there just a strip of yellow paper, foam embellishments and a sentiment along the side instead of at the bottom. 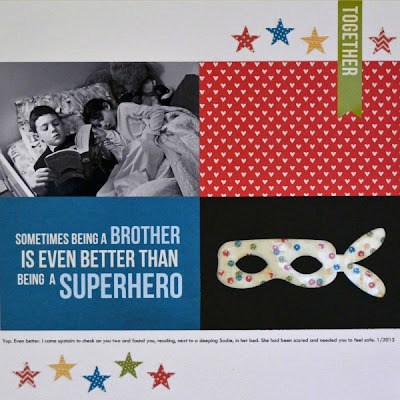 In this house full of girls it was fun to create a boy birthday card and look forward to using it soon!" Have you created something recently that you were inspired by? Link us up in the comments below! A CHA giveaway...and a 20K celebration! As you all know, we love Fridays here at the SCT office. We love sharing brand new products with you and one of the fun parts of walking the CHA show floor was collecting some treats for the best blog readers out there! YOU! I loved every minute of it! So today, not only are you getting a nice treat from Crate Paper and American Crafts BUT you are also getting a one of a kind die from Spellbinders! This beautiful crown is an exclusive from the brand new Imperial Gold collection that adds a forth dimension to die templates - cut, emboss, stencil….and yes, they DEBOSS too! I don't think too many of these were made so it's a must have! If you would like to win this fun prize package, just leave a comment below before Thursday, January 31st at 6:00 p.m. EST! Good luck my friends! Congrats Marylou! 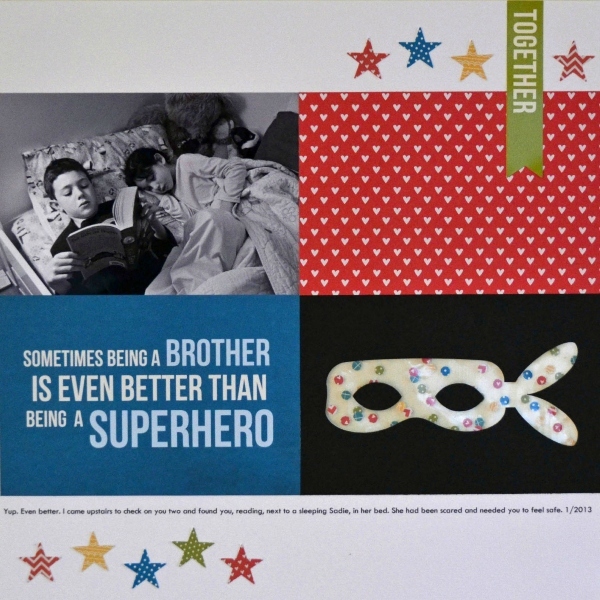 Please send your address to us at ideas@scrapbookandcards.com and put "CHA winner" in your reference line. Yes, an iPad mini! This way you can be in touch with us all. the. time! Just head on over to our facebook fan page HERE and if you are not already a fan, click "like" and enter too! We love sharing, we love giving and we love all our fans everywhere. Thank you for making each day an exciting one for us at the magazine and thank you for being THE best readers out there! Fun finds around the web! As I sat watching some mindless TV last night I found some fun things that caught my eye this week and of course, I just had to share them with YOU! 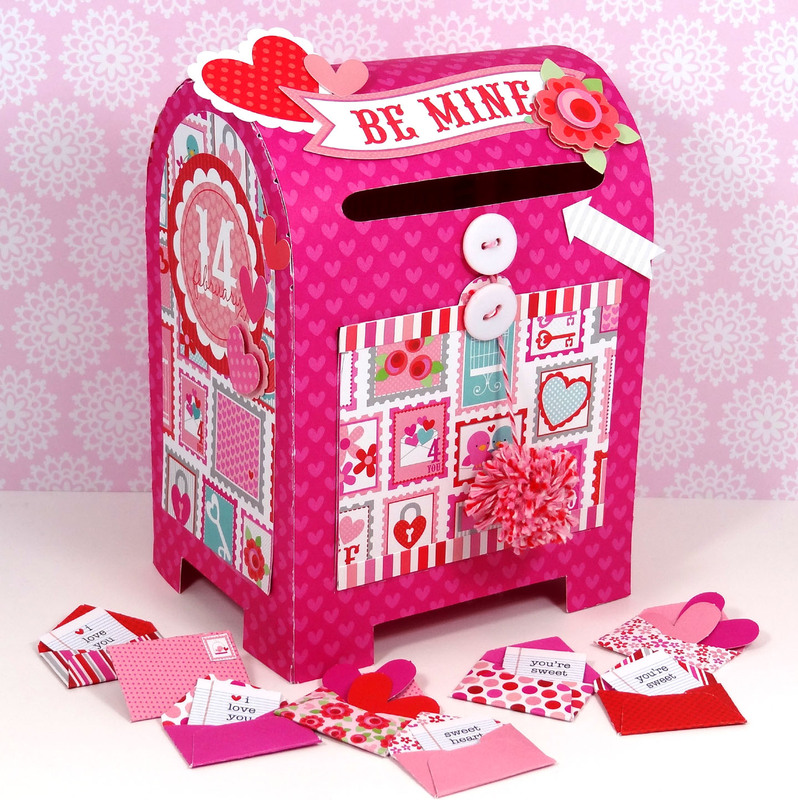 After seeing some of these projects, I know this weekend I may spend some time getting crafty and get an early start on Valentine's cards! heehee! Had to show these cute straws from the Queen & Co. blog!